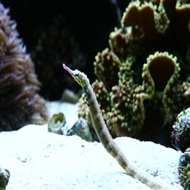 Pipefish are relatively hardy and adjust well to aquarium life if maintained in water conditions with low to medium current and plenty of branching gorgonias, algae, or coral decorations. We have, however, experienced good success with them in high flow reef aquariums as well. Live foods such as vitamin-enriched brine shrimp, small ghost shrimp, or copepods and amphipods found in live rock are usually preferred. NutraMar Ova Prawn Roe, Cyclop-Eze, and other small frozen foods are usually eaten as well.